I have been a fan of the Sugar Lip treatments from Fresh Beauty since last few years and I loved them so much that I did try once to pick all the shades from Sephora but then I stopped to just use the ones I already have. 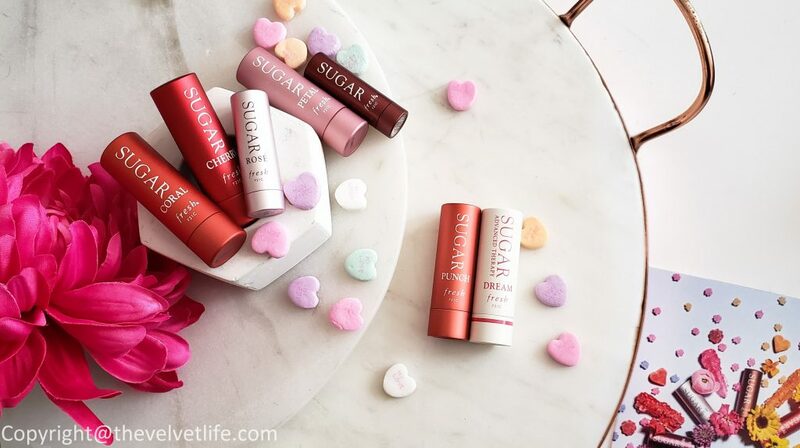 There are two new additions to the overall Sugar Lip Collection, the subtle shade is the Sugar Dream Lip Treatment Advanced Therapy and the statement shade is the Sugar Punch Tinted Lip Treatment SPF15. Sugar Dream Lip Treatment Advanced Therapy (CAD $32) is sheer pink in color, it moisturizes, boosts volume, and smoothes the look of fine lines. The Sugar Dream Lip Treatment Advanced Therapy enhances lips natural rosy color while providing the same age-defying benefits as the best selling Sugar Lip Treatment Advanced Therapy. It deeply nourishes and combats dryness all day long, boosts volume and definition, and smoothes the look of fine lines and wrinkles. The lips are fuller-looking, silky soft, and the end result is baby pink pout. Sugar Dream Lip Treatment Advanced Therapy is a multifunctional product. It can be worn alone for an age-defying hint of tint, or as a base under your favorite Sugar Tinted Lip Treatment for sun protection and richer color. The key ingredients are Sugar, Sea fennel extract, soft orange extract, hyaluronic filling spheres, Cupuacu butter, plum seed oil, passionflower seed oil and Commiphora extract. I do feel my lips are smooth, moisturized, and supple. When I leave it as an overnight treatment, there are visible results in the morning, no dry flakes and dry lips are improved. Sugar Punch Tinted Lip Treatment SPF15 (CAD $29) is luscious, vibrant in color. It moisturizes, protects, and smoothes lips with a tropical red-orange tint. The juicy tantalizing color is perfect for all skin types and adventures. Sugar Punch Tinted Lip Treatment SPF15 is a versatile formula that allows for buildable coverage to create a sheer or rich hue. The key ingredients are Sugar, a blend of nourishing oils, grapeseed oil, Vitamin C and E, Beeswax, and Carnauba wax. To use them both together, swipe on Sugar Dream first as a base, then apply Sugar Punch for a custom color. Sugar Dream Lip Treatment Advanced Therapy is available at Sephora Canada and Nordstrom. Sugar Punch Tinted Lip Treatment SPF15 is available at Sephora Canada and will be available at Nordstrom from May 2018.